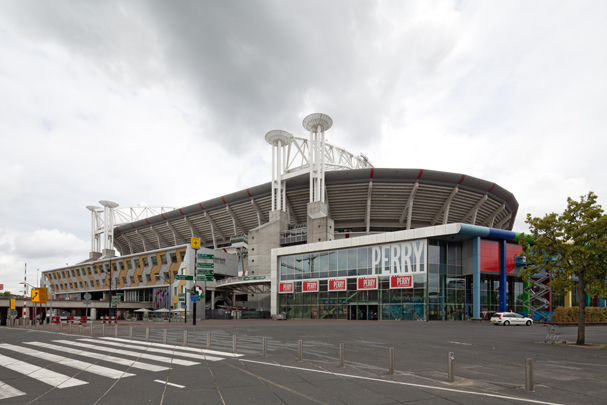 This stadium with a capacity of 50,000 to replace the Olympic Stadium and the De Meer Stadium is also suitable for rock concerts and other events. The building straddles a main road; the gigantic concrete supporting slab needed to perform this task provides natural parking facilities, or rather a 'transferium'. The building's structure consists entirely of prefabricated reinforced concrete. Two enormous curved steel spans bear aloft a glass roof that can be slid open and shut. René van Zuuk's football training centre at Borchlandweg 16, completed at the same time, is also well worth a visit.